What's the smartest way to get your enemy to wildly underestimate you? Act like a bumbling nitwit. Bazooka was driving an Abrams tank in the "Third Horde" (Third Armored Division) when he came to the realization that an illiterate farmer armed with a $200 disposable rocket launcher could knock out a million dollar tank with less than two weeks training. He put in for a transfer immediately. Training: Advanced Infantry School, Fort Benning; Armor School, Fort Knox. Qualified expert: Dragon anti-tank missile, Milan System anti-tank missile, LAW rocket, Recoilless rifle, LAW System and all Warsaw Pact RPG systems. He is also EOD (Explosive Ordnance Disposal) qualified up to the tac-op category. The filecard goes on to describe Bazooka as "a decisive fast-thinker with all the instincts of a natural survivor," which is a huge departure from the Bazooka that most folks know: as a 1985 introductee, he was a prominent character on the cartoon, where he was depicted as kind of slow, almost like Lenny in Of Mice and Men. Maybe it was just a ruse to make people underestimate him, but you really got the idea that he was wearing that helmet for more than battlefield protection. Bazooka is a surprisingly big figure. He never seemed particularly beefy in the comics or cartoon (at least not until the Joe team was decommissioned and he started hitting the Hostess Fruit Pies), but the toy is really bulky. He stands 4¼" tall, and is fairly muscular. Huge guy. Well, nobody ever said all the Joes had to be a uniform bodytype, after all. He also obviously enjoys the Joe Team's lax dress code, because I don't think the normal Army will let guys out into the field wearing a football jersey. Just like the original figure, Bazooka gets a removable helmet. This one is molded with a chin strap, though, so it will stay in place better. Beneath it he has wavy black hair and facial features that are almost Mongolian. I don't know what kind of name "Katzenbogen" is, but you can't claim Bazooka just has a generic face. The head is a bit small, but then, that could just be because the body is so large. Bazooka's paint is good, but it's disappointing that his big "14" had to be split over a joint. Unless you keep him hunched over slightly, a big red gap runs right through the middle of his shirt. 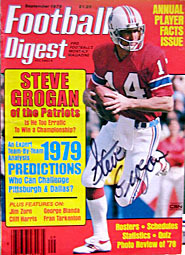 The jersey, by the way, belongs to Steve Grogan, quarterback for the New England Patriots from 1975-1990. Why's a guy from Minnesota like the Pats? Maybe his folks were originally from New England. Amusingly, when Bazooka joined Tiger Force, his jersey was done in Dolphins' colors. 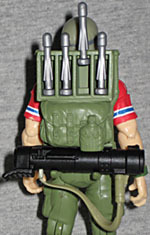 'zook's accessories include a backpack and his namesake weapon. The bazooka has a green strap and can be stowed on hooks under the backpack, and there are four gray rockets stored up top. On the original toy, they were just a part of the mold, but here, they're separate, removable, and actually fit into the weapon. What fun! In the package, they're plugged in at the bottom of the rocket, but you can also fit them in by the neck. 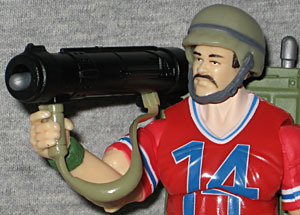 Bazooka was introduced in 1985, just the right time to be one of the major characters on the cartoon, so he's popular and well-known. This G3 update is nice, and the size issue is minor. In fact, given his bulk and the football jersey, he might even be a good base for a custom Fridge.